This story was updated at 2:06 p.m. EDT. Two identical space probes are on their way to the moon, after launching today (Sept. 10) on NASA's newest lunar science mission aimed at unlocking mysteries of the moon that are hidden beneath its surface. Less than two hours after their launch, the twin Grail-A and Grail-B probes were deployed, setting them en route to their lunar destination. The $496 million Grail mission (short for Gravity Recovery And Interior Laboratory) will closely study the interior of the moon, from crust to core, and will map the moon's gravitational field in unprecedented detail. The three-month mission is expected to help scientists better understand the composition of Earth's natural satellite and its evolutionary history since it was formed 4.6 billion years ago. The two Grail spacecraft blasted off this morning on an unmanned Delta 2 rocket at 9:08 a.m. EDT (1308 GMT) from the Cape Canaveral Air Force Station in Florida, after windy weather and a technical glitch delayed the mission's launch by two days and threatened to again. A first try earlier today at 8:29 a.m. EDT (1229 GMT) was called off due to high-altitude winds, but weather conditions improved, and the agency was able to take advantage of the day's second launch opportunity. 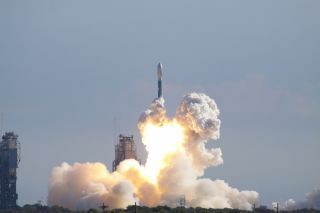 Today's launch is the last planned launch of a Delta 2 from the Cape Canaveral Air Force Station's launch complex. The workhorse rocket has had an illustrious career, which includes being the vehicle that carried the Mars rovers Spirit and Opportunity into orbit on their journey to the Red Planet. The two spacecraft, called Grail-A and Grail-B, are flying on an energy-efficient path to the moon, and are expected to arrive at their lunar target around New Year's Day (Jan. 1). "We've used gravity science before, however these have been very primitive attempts compared to what Grail will be able to accomplish," Robert Fogel, Grail program scientist at NASA Headquarters in Washington, D.C., said in a news briefing on Wednesday (Sept. 7). Understanding how the origin of the moon and how it evolved will shed light on how other rocky planets in the inner solar system formed, said Maria Zuber, Grail principal investigator at MIT. The twin probes will then enter into tandem orbits around the moon, separated from each other by a distance of about 75 to 225 miles (121 to 362 kilometers). The spacecraft will circle the moon about 34 miles (55 km) above the surface. As the Grail spacecraft chase each other around the moon, regional differences in the lunar gravitational field will cause the probes to speed up or slow down, changing the distance between them, explained Sami Asmar, Grail deputy project scientist at NASA's Jet Propulsion Laboratory in Pasadena, Calif.
Understanding how the moon formed and evolved will help scientists piece together clues of how other large objects in the inner solar system came to be. "The moon is a fantastic body … in terms of learning about early planets," Zuber said. "It's nearby, it's accessible, and it preserves the record of what early planets are like. Other planets in the inner part of the solar system have gone through the same processes that the moon has gone through." The Grail mission is also expected to raise public awareness about the moon, and special cameras aboard the probes will be used to encourage middle school students to participate in lunar science and follow along with the Grail expedition. The so-called MoonKam project, which will capture pictures of the lunar surface for students on Earth, is being led by former NASA astronaut Sally Ride and her educational company Sally Ride Science. As part of their public outreach efforts, NASA also invited 150 Twitter fans to attend the launch and share their experiences with the public through social media. The agency also announced it will hold a contest for students of all ages across the U.S. to select a name for the Grail lunar probes. The contest will run from Oct. 14 to Nov. 11 and students will be invited to submit essays explaining their choice of names, Zuber said. NASA will announce additional details about the contest soon, but the winners will be announced before the Grail spacecraft arrive in lunar orbit. NASA's broadcast of the Grail launch suffered a power outage shortly after both the Grail-A and Grail-B probes were deployed. Video was recovered shortly after, with only a short interruption to the agency's post-launch commentary.